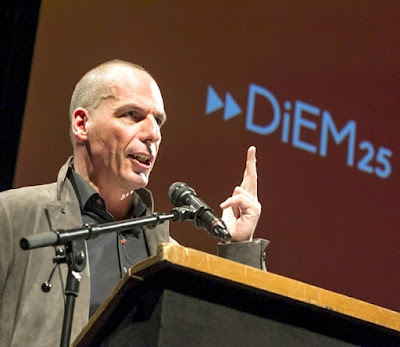 The simple truth about Yanis Varoufakis and his DiEM25 party - Soviet-Empire.com U.S.S.R.
By Nikos Mottas/ In Defense of Communism. "The European Union was an exceptional achievement, bringing together in peace European peoples speaking different languages, submersed in different cultures, proving that it was possible to create a shared framework of human rights across a continent that was, not long ago, home to murderous chauvinism, racism and barbarity. [...] Alas, today, a common bureaucracy and a common currency divide European peoples that were beginning to unite despite our different languages and cultures. A confederacy of myopic politicians, economically naïve officials and financially incompetent ‘experts’ submit slavishly to the edicts of financial and industrial conglomerates, alienating Europeans and stirring up a dangerous anti-European backlash. Proud peoples are being turned against each other. Nationalism, extremism and racism are being re-awakened. [...] At the heart of our disintegrating EU there lies a guilty deceit: A highly political, top-down, opaque decision-making process is presented as ‘apolitical’, ‘technical’, ‘procedural’ and ‘neutral’. Its purpose is to prevent Europeans from exercising democratic control over their money, finance, working conditions and environment. The price of this deceit is not merely the end of democracy but also poor economic policies". So, the problem according to Varoufakis and his new 'movement' is how democracy is applied in the EU, how the EU institutions work. Classless references about "democracy" in general (democracy for whom? ), illusions about the "democratisation" of an imperialist union (EU) and other fairy tales for social-democratic minds. "The European Union was an exceptional achievement" says the DiEM25 manifesto, but forgets to mention the real purpose behind EU's foundation. No word about Capitalism, not a single word about the profitability of the large european corporations and monopolies, not a single word about the european bourgeoisie in the large states (Germany, France, Britain, Italy etc). Yanis Varoufakis and his new "party" want to "democratise the EU". In fact, they want to "democratise" an inherently imperialist union. They want to manage the existing rotten imperialist EU- not to overthrow it. Such ideas serve only to inter-imperialist antagonisms and have nothing to do with the interests of the working class in Europe. The ideas presented from Varoufakis and his DiEM25 party are purposely unclear because they want to hide the real aim: their total compliance with the Capitalist system, with the free-market law, with the profitability of large corporations and monopolies. Yannis Varoufakis has described himself as an "erratic marxist". Maybe he is erratic, but certainly not a marxist. Varoufakis was the finance minister of the first Tsipras' government in Greece. He is the one who, during a press conference in Berlin on February 2015, said: "We will not throw the present program (the austerity program of the Memorandum), we'd also want the 67% of the measures but the problem is that the program lacks some very significant reforms". These words were said by the "marxist" finance minister of a "left" government. Taking into account that Mr.Varoufakis' new iniative was warmly welcomed by parties such as the german Die Linke, the spanish Podemos, the british Greens and Alexis Tsipras' ex-mentor Slavoj Žižek, we can easily understand what it's all about: the same, old social-democratic soup served in a new dish.